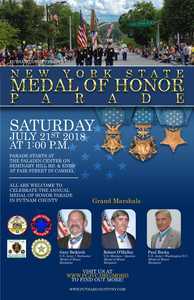 This historic medal of honor parade in Putnam County New York will have all five military branches, veterans, marching bands, vehicles and more! It will also showcase New York’s Own Medal Of Honor Recipients, four of whom will be taking part. The parade route goes along the shores of lake gleneida where the row of honor will line the parade route. There will be a grand stand at the historic court house with live commentary and speeches and at the very end of the parade join us for the festival.